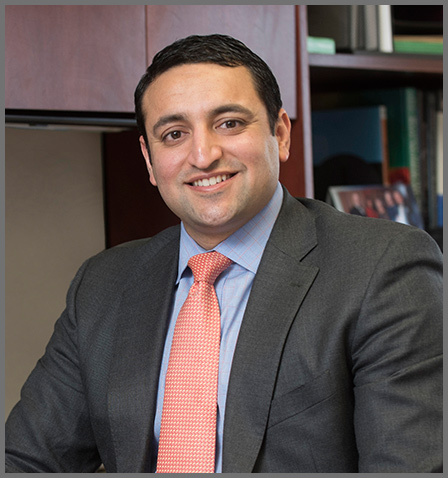 Dr. Makhni is a board-certified orthopedic surgeon specializing in sports medicine and joint preservation of the shoulder, elbow, hip, and knee. He also has extensive training in non-operative and injection-based modalities for joint preservation and injury recovery. He has a strong research background in managing shoulder and elbow injuries in overhead athletes and baseball players, including Tommy John Surgery and labral repairs. He also has extensive training in treatment of complex hip and knee injuries, including hip preservation surgery for labral tears and complex knee ligament reconstruction. Dr. Makhni was born in Chicago but grew up on the east coast of Florida. He attended the Massachusetts Institute of Technology, where he completed his Bachelor of Science degree in Biological Sciences. He went on to complete a dual MD/MBA program at Harvard Medical School and Harvard Business School. Following graduation, he completed his residency training in orthopedic surgery at Columbia University in New York City, as well as specialized sports medicine fellowship at the renowned Rush University Medical Center. He has served as a team physician for multiple professional and semi-professional athletic teams, such as the Chicago Bulls and the Chicago White Sox. 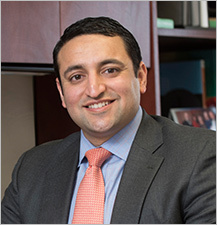 Dr. Makhni is on faculty at the Henry Ford Hospital and Wayne State University in the Department of Orthopedic Surgery and Division of Sports Medicine. He sees patients in West Bloomfield and Troy. He has a number of ongoing clinical research projects working with athletes of all different skill and age levels. Click here to access Dr. Makhni’s published research projects. He is also a member of several professional organizations, such as the American Academy of Orthopedic Surgeons (AAOS), the American Orthopaedic Society for Sports Medicine (AOSSM), and the Arthroscopy Association of North America (AANA). He was recently appointed as a committee member of the STOP! 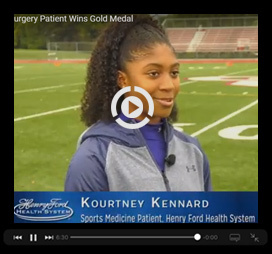 Sports Injuries Campaign. He is very passionate about international service and has completed surgical missions in the Dominican Republic as well as in India. Dr. Makhni currently serves as team physician for the Detroit Lions and Detroit City FC professional organizations, as well as the Cranbrook Kingswood School and Bloomfield Hills High School. Makhni EC, Steinhaus ME, Lamba N, Cole BJ, Romeo AA, Verma NN, Kadiyala RK. Cost savings of transition to outpatient primary total shoulder replacement. In preparation, J Shoulder Elbow Surg. Ahmad CS, Padaki AS, Noticewala MS, Makhni EC, Popkin, CA. The Youth Throwing Score: validating injury assessment in young baseball players. In revision, Am J Sports Med. Okoroha KR, Jildeh TR, Moutzouoros V, Makhni EC. Impact of fatigue on medial elbow torque in baseball pitchers: a simulated game analysis. Article in press. Am J Sports Med. Okoroha KR, Lizzio VA, Meta F, Ahmad CS, Moutzouros V, Makhni EC. Predictors of elbow torque among youth and adolescent baseball pitchers. Am J Sports Med, 2018: May. PMID 29746146. Marshall NE, Jildeh TR, Okoroha KR, Patel A, Moutzouros V, Makhni EC. Epidemiology, workload, and performance of Major League Baseball Pitchers placed on the disabled list. Orthopedics, 2018: May. PMID 29738598. Okoroha KR, Evans TJ, Stephens JP, Makhni EC, Moutzouoros V. Three-dimensional printing improves osteochondal allograft placement in complex cases. Knee Surg Sports Traumatol Arthrosc., 2018: Feb. PMID: 29441429. Unger RZ, Burnham JM, Gammon L, Malempati CS, Jacobs CA, Makhni EC. The responsiveness of patient-reported outcome tools in shoulder surgery is dependent on the underlying pathological condition. Am J Sports Med, 2018: Jan. PMID 29323925. Makhhi EC, Lizzio VA, Meta F, Stephens JP, Okoroha KR, Moutzouros V. Assessment of elbow torque and other parameters during the pitching motion: comparison of fastball, curveball, and change-up. Arthroscopy, 2017: Dec. PMID 29289396. Saltzman BM, Ukwuani G, Makhni EC, Stephens JP, Nho SJ. The effect of platelet-rich fibrin matrix at the time of gluteus medius repair; a retrospective comparative study. Arthroscopy, 2017: Dec. PMID 29287951. Fidai MS, Saltzman BM, Meta F, Lizzio VA, Stephens JP, Bozic KJ, Makhni EC. Patient-reported outcomes measurement information system and legacy patient-reported outcome measures in the field of orthopaedics: a systematic review. Arthroscopy, 2017: Oct. PMID 29096979. Lizzio VA, Meta F, Fidai M, Makhni EC. Clinical evaluation and physical exam findings in patients with anterior shoulder instability. Curr Rev Musculoskeletal Med, 2017: Dec. PMID 29043566. Cvetanovich GL, Lizzio V, Meta F, Chan D, Zaltz I, Nho SJ, Makhni EC. Variability and comprehensiveness of North American online available physical therapy protocols following hip arthroscopy for femoroacetabular impingement and labral repair. Arthroscopy, 2017: Nov. PMID 28969949. Makhni EC, Higgins JD, Hamamoto JT, Cole BJ, Romeo AA, Verma NN. Patient compliance with electronic patient reported outcomes following shoulder arthroscopy. Arthroscopy, 2017: Nov. PMID 28958797. Stone AV, Jacobs CA, Luo TD, Meadows MC, Nho SJ, Stubbs AJ, Makhni EC. High degree of variability in reporting of clinical and patient-reported outcomes after hip arthroscopy. Am J Sports Med, 2017: Sept. PMID 28922016. Trofa DP, Gancarczyk SM, Lombardi JM, Makhni EC, Popkin CA, Ahmad CS. Visualization of the capitellum during elbow arthroscopy: a comparison of three portal techniques. Orthop J Sports Med, 2017: June. PMID 28680895. Makhni EC, Stone AV, Ukwuani GC, Zuke W, Garabekyan T, Mei-Dan O, Nho SJ. A Critical Review: management and surgical options for articular defects of the hip. Clin Sports Med, 2017: July. PMID 28577713. Okoroha KR, Marfo K, Meta F, Matar R, Shehab R, Thompson T, Moutzouoros V, Makhni EC. Amount of minutes played does not contribute to anterior cruciate ligament injury in National Basketball Association athletes. Orthopedics, 2017: July. PMID 28481383. Francis T, Washington T, Srivastava K, Moutzouros V, Makhni EC, Hakeos W. Societal costs in displaced transverse olecranon fractures: using decision analysis tools to find the most cost-effective strategy between tension band wiring and locked plating. J Shoulder Elbow Surg, 2017: Nov (26). PMID 28927668. Makhni EC, Stone AV, Ukwuani GC, Zuke W, Garabekyan T, Mei-Dan O, Nho SJ. Management and surgical options for articular defects in the hip: a critical review. In press, Clin Sports Med. Jacobs CA, Burnham JM, Makhni EC, Malempati CS, Swart EF, Johnson DL. To augment or not? Clinical and cost analysis of routine allograft augmentation in select young patients undergoing anterior cruciate ligament reconstruction with hamstring autograft. In press, Am J Sports Med. Lehman JD, Nwachukwu BU, Ferraro R, Rebolledo BJ, Makhni EC, Verma NN, Gulotta LV. Publication rates of podium presentation abstracts at the Arthroscopy Association of North America Annual Meetings 2004-2012. Arthroscopy, 2017; Jan 24. PMID 28130032. Ahmad CS, Padaki AS, Noticewala MS, Makhni EC, Popkin, CA. The Youth Throwing Score: validating injury assessment in young baseball players. Am J Sports Med, 2017: Feb; 45 (2); 317-24. PMID 28146405. Gacarczyk SM, Jang ES, Swart EF, Makhni EC, Kadiyala RK. Percutaneous trigger finger release: a cost-effectiveness analysis. J Am Acad Orthop Surg. 2016: Jul; 24(7): 475-82. PMID: 27314924. Makhni EC, Meyer MS, Saltzman BM, Cole BJ. Comprehensiveness of outcome reporting in studies of articular cartilage defects of the knee. Arthroscopy, 2016: June epub ahead of print. PMID 27324972. Steinhaus ME, Makhni EC, Gulotta L, Verma NN. Variability in SLAP outcome reporting. J Shoulder Elbow Surg, Aug, 2016. PMID 27497788. Makhni EC, Saltzman B, Moutzouros V, Cole BJ, Romeo AA, Verma NN. Outcome reporting of shoulder and elbow injuries in baseball players: are we reporting relevant results? Am J Sports Med, epub April. PMID: 27159299. Steinhaus ME, Makhni EC, Gulotta L, Cole BJ, Romeo AA, Verma NN. Outcomes after patch use in rotator cuff repair. Arthroscopy, epub May. PMID 27157657. Makhni EC, Lamba N, Swart E, Ahmad CS, Romeo AA, Verma N. Revision arthroscopic repair versus Latarjet procedure in patients with recurrent instability following initial repair attempt: a cost-effectiveness study. Arthroscopy, epub April. PMID 27132770. Makhni EC, Padaki A, Petridis P, Steinhaus ME, Ahmad CS, Cole BJ, Bach BR. High variability in outcomes reporting patterns in high-impact ACL literature. J Bone Joint Surg 2015 Sept 16 (97): 1529-42. PMID 26378269. Makhni EC, Steinhaus M, Swart EF, Bozic KJ. What are the strength of recommendations and methodologic reporting in health economic studies in orthopaedic surgery? Clin Orthop Rel Res. 2015 May 30. PMID 26024580. Makhni EC, Steinhaus ME, Morrow ZS, Jobin CM, Cole BJ, Bach BR Jr. Outcomes assessment in rotator cuff tear literature: what are we measuring? J Shoulder Elbow Surg, 2015 Oct 14. PMID 26475640. Swart E, Vasudeva E, Makhni EC, Bozic KJ. An economic analysis of a dedicated perioperative co-management program for geriatric hip fractures. Clin Orthop Rel Res. 2015: Aug 11. PMID 26260393. Dy CJ, Bumpass DB, Makhni EC, Bozic KJ. The evolving role of clinical registries: existing practices and opportunities for orthopedic surgeons. J Bone Joint Surg. 2016: Jan 20; 98(1):e7. PMID 26791040. Makhni EC, Buza J, Ahmad CS. Academic characteristics of team physicians affiliated with high school, collegiate, and professional teams. Am J Orthop. 2015: November; 44(11):510-4. PMID 26566551. Makhni EC and Ahmad CS. Five points: Exam of the shoulder in overhead athletes. Am J Orthop, 2015: Aug; 44 (8): 347-52. PMID 26251930. Makhni EC, Lee R, Owusu E, Steinhaus ME, Ahmad CS. Return to competition, re-injury, and impact on performance of preseason shoulder injuries in Major League Baseball pitchers. Phys Sports Med, 2015; June 29: 1-7. PMID 26118941. Makhni EC, Jobin CM, Levine WN, Ahmad CS. Five Points: creation of surgical videos with new wearable video capture technology. Am J Orthop, 2015 April; 44(4): 163-6. PMID 25844585. Makhni EC, Steinhaus M, Mehran N, Schulz B, Ahmad CS. Functional outcome and graft retention in patients with septic arthritis following anterior cruciate ligament reconstruction: a systematic review.” Arthroscopy, 2015 Feb 26. PMID 25727493. Makhni EC, Morrow Z, Luchetti T, Mishra P, Lee R, Gualtieri A, Ahmad CS. Arm pain in youth baseball players: a survey of “healthy” players. Am J Sports Med, 2015 Jan; 43 (1): 41-6. PMID 25367016. Makhni EC, Jegede K, Ahmad CS. Pediatric elbow sports injuries. Sports Med Arthroscopy Rev, 2014 Sept 22(3): e16-24. PMID 25077752. Redler LH, Makhni EC, Visco CJ, Ahmad CS. Supinator cyst in a young female softball player successfully treated with aspiration. Am J Orthop, 2015, July; 44(7): E235-8. PMID 26161770. Swart EF, Makhni EC, Macaulay WB, Rosenwasser MP, Bozic KJ. A cost effectiveness analysis of fixation options for intertrochanteric hip fractures. J Bone Joint Surg, 2014 Oct; 96 (19): 1612-20. PMID 25274786. Makhni EC, Buza J, Morrow Z, Ahmad CS. “Sports Reporting:” a comprehensive review of medical literature regarding North American professional sports. Phys Sportsmed, 2014 May 42(2):154-62. PMID 24875982. Makhni EC, Lee R, Morrow Z, Gualtieri A, Ahmad CS. Performance, return to competition, and re-injury following Tommy John surgery in Major League Baseball pitchers: a review of 147 cases. Am J Sports Med, 2014 Apr 3; 42(6):1323-32. PMID 24705898. Makhni EC, Khanna K, Simpson MT, Redler LH, Anakwenze O, Li R, Ahmad CS. Medial Epicondyle Morphology in Elite Overhead Athletes: a Closer Look Using 3-D Computer Simulation. Orthop J Sports Med. 2014 Jan; 2 (1). PMID 26535264. Cadet ER, Makhni EC, Mehran N, Schulz BM. Management of septic arthritis following anterior cruciate ligament reconstruction: a review of current practices and recommendations. J Am Acad Orthop Surg. 2013 Nov; 21 (11):647-56. PMID 24187034. Makhni EC, Li R, Day CS. Workers Compensation: how do orthopaedic surgeons fare? Am J Orthop. 2011, May: 40(5)E71-7. PMID 21734936. Day CS, Makhni EC, Mejia E, Lage D, Rozental TD. Carpal and cubital tunnel syndrome: who gets surgery? Clin Orthop Rel Res. 2010, 468 (7):1796-803. PMID 20049568. Makhni EC, Taghinia A, Ewald T, Zurakoski D, Day CS. Comminution of the dorsal metaphysis and its effects on the radiographic outcomes of distal radius fractures. J Hand Surg (E). 2010, March 17. PMID 20237191. Hartzell T, Makhni EC, Sampson C. Long-term results of periarterial sympathectomy. J Hand Surg (Am). 2009, 34(8): 1454-60. PMID 19683883. Makhni EC, Ewald T, Kelly S, Day CS. Effect of patient age on the radiographic outcomes of distal radius fractures subject to nonoperative treatment. J Hand Surg (Am). 2008, 33: 1301-8. PMID 18929192. Rozental TD, Makhni EC, Day CS, Bouxsein M. Improving evaluation and treatment for osteoporosis following distal radial fractures: a prospective randomized intervention. J Bone Joint Surg. 2008, 90:953-961. PMID 18451385. Synn A, Makhni EC, Makhni MC, Rozental TD, Day CS. Distal radius fractures in older patients: is anatomic reduction necessary? Clin Orthop Rel Res. 2009, 467(6): 1612-20. PMID 19082864. Day CS, Kamath AF, Makhni EC, Jean-Gilles J, Zurakowski D. “Sandwich” plating for intra-articular distal radius fractures with volar and dorsal metaphyseal comminution. Hand. 2008, 3:47-55. PMID 18780121. Alexander M, Franko OI, Makhni EC, Day CS. Validation of a Modern Activity Hand Survey with Respect to Reliability, Construct and Criterion Validity. J Hand Surg (E). 2008, 33: 653-60. PMID 18977836. Turchin A, Kolatkar NS, Grant RW, Makhni EC, Pendergrass ML, Einbinder JS. Using regular expressions to abstract blood pressure and treatment intensification information from the text of physician notes. J Am Med Inform Assoc. 2006, 13(6): 691-5. PMID 16929043. Makhni MC, Makhni EC, Swart E, Day CS. Emergency Orthopedics. Publisher: Springer, New York City, New York, USA. Makhni EC, Hamamoto J, Jain A, Verma NN. Double row rotator cuff repair: a technique guide. In press, for Disorders of the Rotator Cuff, Biceps, and Tendon. Ahmad CS, Makhni EC, ElAttrache NE. “Special Patients: the Overhead Athlete,” in Disorders of the Proximal Biceps Tendon: Evaluation and Treatment, American Academy of Orthopaedic Surgeons, Monograph Series, 2014. Makhni EC and Strauch RJ. Entrapment syndromes are What and Where? Does Work Play a Role in Causality? Worker’s Compensation, a Primer for Hand Surgeons, American Society for Surgery of the Hand, September 2012. Makhni EC, Schulz BM, Levine WN. Arthroscopic treatment of calcific tendinitis. In: Video Atlas of Shoulder Surgery. (McCann PD – Editor). Jaypee Brothers Medical Publishers LTD. Chapter 56, pp. 197-201. Schulz BM, Makhni EC, Levine WN. Epidemiology, Clinical Evaluation, Imaging and Classification of Sternoclavicular Joint Injuries. Disorders of the Shoulder, Diagnosis and Management: Shoulder Trauma, 3rd Chapter 19, Pages 253-7. Philadelphia, 2014. Schulz BM, Makhni EC, Levine WN. Non-operative Management of Sternoclavicular Joint Injuries: Indications, Techniques and Outcomes. Disorders of the Shoulder, Diagnosis and Management: Shoulder Trauma, 3rd Chapter 20, Pages 257-60. Philadelphia, 2014. Makhni EC, Davis R, Day CS. Dislocation reduction of the shoulder joint. Procedures Consult, online: 2008. Moderator, Panel Member. Getting your research off the ground. American Academy of Orthopaedic Surgeons (AAOS) Annual Conference, San Diego, CA, 2017. Makhni EC, Verma NN, Bozic KJ, Ayres D. Moderator, Instructional Course Lecture (ICL). Patient reported outcomes in clinical practice. American Academy of Orthopaedic Surgeons (AAOS) Annual Conference, San Diego, CA, 2017. Makhni EC, Kelly BT, Larson C, Nho SJ. Approach to the patient with failed hip arthroscopy. Instructional Course Lecture (ICL), American Orthopaedic Society for Sports Medicine (AOSSM) Annual Meeting, Toronto, 2017. Moderator, Panel Member. American Academy of Orthopaedic Surgeons (AAOS) Webinar: Research During Residency, Part II: Efficiency, Execution, and Focus. Online, March, 2016. Makhni EC, Swart EF, Mather RC, Bozic KJ. Cost-effectiveness research in orthopedics: what you need to know. Instructional Course Lecture. American Academy of Orthopaedic Surgeons (AAOS) Annual Conference, Orlando, FL, 2016. Associate Instructor, Arthroscopy Association of North America (AANA) Resident/Fellow Course: Fundamentals in Arthroscopy. Rosemont, IL, October, 2015. Panel Member, American Academy of Orthopaedic Surgeons (AAOS) Board of Specialty Societies webinar: “Tips for the orthopaedic fellowship match.” Online, September, 2014. Okoroha KR, Meldau J, Jildeh TR, Moutzouros V, Makhni EC. Impact of pitch type on medial elbow torque in youth baseball pitchers. Podium Presentation. Arthroscopy Association of North America (AANA) Annual Conference, Chicago, IL, 2018. Jildeh TR, Meta F, Lizzio VA, Makhni EC. Impact of patient demographics on time to completion for electronically administered PROMIS and VAS forms in the ambulatory orthopedic clinics. Poster presentation. American Academy of Orthopedic Surgeons (AAOS) Annual Conference, New Orleans, LA, 2018. Fidai MS, Mea F, Lizzio VA, Muh SM, Moutzouros V, Makhni EC. The PROMIS initiative: a universal patient-reported outcome system with orthopedic utility. Scientific Exhibit. American Academy of Orthopedic Surgeons (AAOS) Annual Conference, New Orleans, LA, 2018. Marshall NE, Jildeh TR, Okoroha KR, Meta F, Lizzio VA, Moutzouros V, Makhni EC. Performance, return to play, and career longevity after ulnar collateral ligament reconstruction in professional catchers. Podium presentation. American Academy of Orthopedic Surgeons (AAOS) Annual Conference, New Orleans, LA, 2018. Makhni EC, Higgins JD, Hamamoto JT, Cole BJ, Romeo AA, Verma NN. Patient compliance with electronic patient reported outcomes: a cohort study. E-Poster presentation. Arthroscopy Association of North America (AANA) Annual Conference, Denver, CO, 2017. Makhni EC, Kuhns BJ, Stephens J, Alter J, Lizzio V, Nho SJ. Responsiveness of patient reported outcomes following hip arthroscopy for femoroacetabular impingement: which score is most relevant, and for whom? E-Poster presentation. Arthroscopy Association of North America (AANA) Annual Conference, Denver, CO, 2017. Unger R, Malempati C, Burnham J, Jacobs C, Makhni EC. Responsiveness of PRO after shoulder surgery: a systematic review and meta-analysis. Podium Presentation. Mid America Orthopaedic Association (MAOA) Annual Meeting, 2017. Makhni EC and Franko OI. Practice websites with a purpose: use Wordpress to optimize your SEO. Technology Theater Session. American Academy of Orthopaedic Surgeons (AAOS) Annual Conference, San Diego, CA, 2017. Franko OI and Makhni EC. Building your online presence. Technology Theater Session. American Academy of Orthopaedic Surgeons (AAOS) Annual Conference, San Diego, CA, 2017. Makhni EC, Lizzio V, Meta F. Introduction and Primer to REDCap for Online Clinical Outcome Collection. Technology Theater Session. American Academy of Orthopaedic Surgeons (AAOS) Annual Conference, San Diego, CA, 2017. Trofa DP, Parisien RL, Noticewala MS, Noback P, Ahmad CS, Levine WN, Moutzouros V, Makhni EC. Quality and variability of online physical therapy protocols for arthroscopic anterior shoulder instability repairs. Poster presentation. American Academy of Orthopaedic Surgeons (AAOS) Annual Conference, San Diego, CA, 2017. Makhni EC, Hamamoto J, Higgins J, Patterson T, Griffin J, Romeo AA, Verma NN. How comprehensive and efficient are patient reported outcomes for rotator cuff tear. E-Poster presentation. American Shoulder and Elbow Society (ASES) Fall Meeting, Boston, 2016. Weber AE, Makhni EC, Kuhns B, Cvetanovich G, Harris JD, Salata M, Mather RC, Nho SJ. An evaluation of the interportal capsulotomy made with the modified anterior portal: comparable utility with decreased capsule morbidity. E-Poster presentation. International Society for Hip Arthroscopy (ISHA) Annual Meeting, San Francisco, CA, 2016. Makhni EC, Hamamoto JT, Higgins J, Patterson T, Romeo AA, Verma NN. Patient reported outcomes for rotator cuff disease – Which PRO should you use? Podium presentation. American Orthopaedic Society for Sports Medicine (AOSSM) Annual Meeting, Colorado Springs, CO, 2016. Makhni EC, Steinhaus ME, Weber AE, Jobin CM, Cole BJ, Bach BR Jr. Outcomes assessment in rotator cuff pathology: what are we measuring? Poster presentation. American Orthopaedic Association (AOA) Annual Meeting, Seattle, WA, 2016. Makhni EC, Crump E, Steinhaus ME, Ahmad CS, Verma NN, Cole BJ, Bach BR Jr. Quality and variability of physical therapy protocols for ACL reconstruction. Poster presentation. Arthroscopy Association of North America (AANA) Annual Conference, Boston, MA, 2016. Makhni EC, Lamba N, Steinhaus ME, Swart E, Ahmad CS, Romeo AA, Verma NN. Revision arthroscopic repair versus Latarjet procedure in patients with recurrent instability following initial repair attempt: a cost-effectiveness study. Poster presentation. Arthroscopy Association of North America (AANA) Annual Conference, Boston, MA, 2016. Makhni EC, Crump E, Steinhaus ME, Ahmad CS, Verma NN, Cole BJ, Bach BR. Quality and variability of physical therapy protocols for ACL reconstruction. Podium presentation. American Academy of Orthopaedic Surgeons (AAOS) Annual Conference, Orlando, FL, 2016. Makhni EC, Lamba N, Swart EF, Steinhaus ME, Ahmad CS, Romeo AA, Verma NN. Cost-effectiveness of revision arthroscopic repair versus Latarjet for recurrent instability following initial repair. Podium presentation. American Academy of Orthopaedic Surgeons (AAOS) Annual Conference, Orlando, FL, 2016. Makhni EC, Steinhaus ME, Swart EF, Bozic KJ. Recommendation strength and methodological reporting in health economic studies in orthopaedic surgery. Podium presentation. American Academy of Orthopaedic Surgeons (AAOS) Annual Conference, Orlando, FL, 2016. Makhni EC, Verma NN. Utilization of electronic patient collection and outcome reporting systems in orthopedic practice. Electronic Skills Pavilion Presentation. American Academy of Orthopaedic Surgeons (AAOS) Annual Conference, Orlando, FL, 2016. Makhni EC, Moutzouros V. Incorporating smartphone apps into sports medicine clinical practice: linking community with providers to deliver real-time care. Electronic Skills Pavilion Presentation. American Academy of Orthopaedic Surgeons (AAOS) Annual Conference, Orlando, FL, 2016. Bozic KJ and Makhni EC. Performance measures, outcomes, and value creation in total knee arthroplasty. Podium Presentation: “Strategies to improve total knee arthropasty). Orthopedic Research Society (ORS) Annual Conference, Orlando, FL, 2016. Makhni EC. Creation of Surgical Videos with New Wearable Video Capture Technology. Electronic Skills Pavilion Presentation. American Academy of Orthopaedic Surgeons (AAOS) Annual Conference, Las Vegas, NV, 2015. Makhni EC, Morrow ZS, Luchetti TJ, Gualtieri AG, Lee R, Ahmad CS. Arm pain in youth baseball players: a survey of “healthy” players. Poster Presentation, American Academy of Orthopaedic Surgeons (AAOS) Annual Conference, Las Vegas, NV, 2015. Makhni EC, Reyes A, Ahmad CS. Strain with respect to epicondyle placement in ulnar collateral ligament reconstruction of the elbow. Poster Presentation, American Academy of Orthopaedic Surgeons (AAOS) Annual Conference, Las Vegas, NV, 2015. Trofa DP, Makhni EC, Watling JP, Bobman J, Ahmad, Jobin CM, Levine WN, Ahmad CS. Closed suction drainage in shoulder arthroplasty: where is the evidence? Poster Presentation, American Academy of Orthopaedic Surgeons (AAOS) Annual Conference, Las Vegas, NV, 2015. Gancarczyk S, Makhni EC, Lombardi J, Popkin CA, Ahmad CS. Radio-capitellar osteochondral defects: a shift from open to arthroscopic articular reconstruction. Podium Presentation, American Academy of Orthopaedic Surgeons (AAOS) Annual Conference, Las Vegas, NV, 2015. Makhni EC, Lee R, Morrow Z, Gualtieri A, Ahmad CS. Performance Metrics Before and After Tommy John Surgery in 160 Professional Pitchers. Podium Presentation, American Academy of Orthopaedic Surgeons (AAOS) Annual Conference, New Orleans, LA, 2014. Makhni EC and Bozic KJ. Why total knees fail. Symposium Presentation, American Academy of Orthopaedic Surgeons (AAOS) Annual Conference, New Orleans, LA, 2014. Swart E, Makhni EC, Macaulay WB, Rosenwasser MP, Bozic KJ. A Cost Effectiveness Analysis of Fixation Options for Intertrochanteric Hip Fractures. Podium Presentation, American Academy of Orthopaedic Surgeons (AAOS) Annual Conference, New Orleans, LA, 2014. Makhni EC, Schulz B, Levine WN. “Arthroscopic Debridement of Calcific Tendinitis.” Surgical Techniques Multimedia Presentation, American Academy of Orthopaedic Surgeons (AAOS) Annual Conference, Chicago, IL, 2013. Ahmad CS and Makhni EC. “Arthroscopic Management of Anterior Instability.” Video chapter; AAOS/ASES 8th Biennial Shoulder and Elbow Meeting, 2012. Makhni EC, Li R, Day CS. Workers Compensation: how do orthopaedic surgeons fare? Podium presentation. American Academy of Orthopaedic Surgeons (AAOS) Annual Conference, New Orleans, LA, 2010. Makhni EC, Tabrizi S, Day CS. Decreasing Costs in Inpatient Hip and Knee Arthroplasties. Poster presentation. American Orthopaedic Association (AOA) Annual Meeting, Bonita Springs, FL, 2009. Makhni EC, Day CS. Cost discrepancies between inpatient and outpatient orthopedic procedures: a comparative study. Poster presentation. American Academy of Orthopaedic Surgeons (AAOS) Annual Conference, Las Vegas, NV, 2009. Makhni EC, Mejia E, Lage D, Zamora A, Zurakowski D, Day CS. Effects of socio-economic status on the management of carpal and cubital tunnel syndrome. Podium presentation. American Association of Hand Surgery (AAHS) Annual Conference, Kauai, HI, 2009. Day CS, Synn A, Makhni EC, Makhni MC, Rozental TD. Distal radius fractures in elderly patients: is anatomic reduction necessary? Podium presentation. American Society for Surgery of the Hand (ASSH) Annual Conference, San Francisco, CA, 2008. Hartzell T, Makhni EC, Sampson C. Long-term results of periarterial sympathectomy. Residents/fellows podium presentation. American Society for Surgery of the Hand (ASSH) Annual Conference, San Francisco, CA, 2008. Makhni EC, Day CS. Secondary displacement of distal radius fractures in women. Poster presentation. American Academy of Orthopaedic Surgeons (AAOS) Annual Conference, San Francisco, CA, 2008. Alexander M, Franco OI, Makhni EC, Zurakowski D, Day CS. Validation of a commonplace modern activity hand survey. Podium presentation. American Academy of Orthopaedic Surgeons (AAOS) Annual Conference, San Francisco, CA, 2008. Makhni EC, Ewald T, Kamath AF, Day CS. Effects of Dorsal Cortex Comminution on Radiographic Outcomes of Distal Radius Fractures. Poster presentation. American Society for Surgery of the Hand (ASSH) Annual Conference, Washington, D.C., 2006. “Elbow Injuries in Athletes,” Lecture, Resident Didactic Series, Columbia University Medical Center, Department of Orthopedic Surgery, October 16, 2014. “ACL Anatomy 101,” Lecture, Resident Didactic Series, Columbia University Medical Center, Department of Orthopedic Surgery, September 25, 2014. “Focal Cartilage Defects of the Knee: Current and Emerging Treatment Algorithms,” Sports Service Rounds, Columbia University, Department of Orthopedic Surgery, September 5, 2013. “Thoracic Outlet Syndrome: What’s the Deal?” Hand Service Rounds, Columbia University Medical Center, Department of Orthopedic Surgery, August 14, 2013. “Upper Extremity Injuries in the Youth Overhead Athlete,” Invited Lecture, Professional Baseball Instruction Academy, Upper Saddle River, New Jersey, June 4, 2013. “Cubital Tunnel Syndrome,” Hand Service Grand Rounds, Columbia University Medical Center, Department of Orthopedic Surgery, December 20, 2012. “Own the Bone: Tumor-Induced Osteomalacia,” Tumor Grand Rounds, Columbia University Medical Center, Department of Orthopedic Surgery, January 12, 2012. “SLAC Wrist Arthropathy,” Hand Service Grand Rounds, Columbia University Medical Center, Department of Orthopedic Surgery, October 20, 2011. “Modified Eden-Lange for Trapezius Palsy,” Techniques Conference, Columbia University Medical Center, Department of Orthopedic Surgery, July 15, 2011.